I have a bone to pick with problems like the following, which is taken from a major university-level calculus textbook. Read it, and see if you can figure out what I mean. 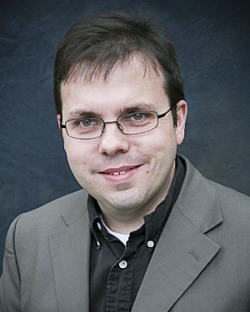 This is located in the latter one-fourth of a review set for the chapter on integration. Its position in the set suggests it is less routine, less rote than one of the early problems. But what’s wrong with this problem is that it’s not a problem at all. It’s an exercise. The difference between the two is enormous. To risk oversimplifying, in an exercise, the person doing the exercise knows exactly what to do at the very beginning to obtain the information being requested. In a problem, the person doesn’t. What makes an exercise an exercise is its familiarity and congruity with prior exercises. What makes a problem a problem is the lack of these things. The above is not a problem, it is an exercise. Use the Midpoint Rule with six subintervals from 0 to 24. That’s the only part of the statement that you even have to read! The rest of it has absolutely nothing with bees, the rate of their population growth, or the net amount of population growth. A student might be turning this in to an instructor who takes off points for incorrect or missing units, and then you have to think about bees and time. Otherwise, this exercise is pure pseudocontext. Worst of all, this exercise might correctly assess students’ abilities to execute a numerical integration algorithm, but it doesn’t come close to measuring whether a student understands what an integral is in the first place and why we are even bringing them up. Even if the student realizes an integral should be used, there’s no discussion of how to choose which method and which parameters within the method, or why. Instead, the exercise flatly tells students not only to use an integral, but what method to use and even how many subdivisions. A student can get a 100% correct answer and have no earthly idea what integration has to do with the question. 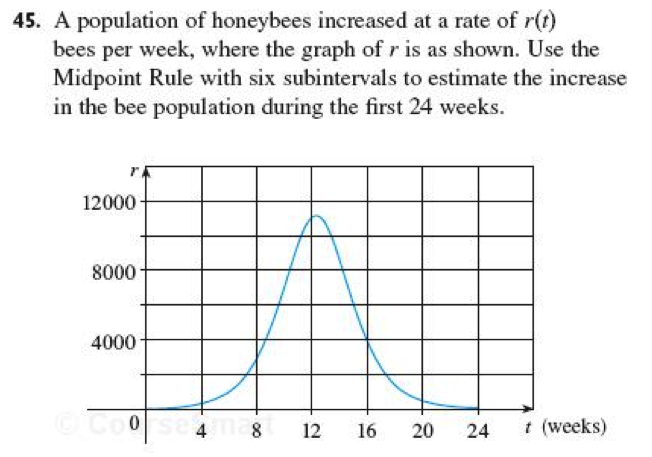 The graph below shows the rate at which a population of honeybees was growing, in bees per week. By about how many bees did the population grow after 24 weeks? This still may not be a full-blown problem yet — and it’s still pretty pseudocontextual, and the student can guess there should be an integral happening because it’s in the review section for the chapter on integration — but at least now we have to think a lot harder about what to do, and the questions we have to answer are better. How do I get a total change when I’m given a rate? Why can’t I just find the height of the graph at 24? And once we realize that we have to use an integral — and being able to make that realization is one of the main learning objectives of this chapter, or at least it should be — there are more questions. Can I do this with an antiderivative? Can I use geometry in some way? Should I use the Midpoint Rule or some other method? Can I get by with, say, six rectangles? or four? or even two? Why not use 24, or 2400? Is it OK just the guesstimate the area by counting boxes? I think we who teach calculus and those who write calculus books must do a better job of giving problems to students and not just increasingly complicated exercises. It’s very easy to do so; we just have to give less information and fewer artificial cues to students, and force students to think hard and critically about their tools and how to select the right combination of tools for the job. No doubt, this makes grading harder, but students aren’t going to learn calculus in any real or lasting sense if they don’t grapple with these kinds of problems. This week (and last) in screencasting: Functions! The reason I made these was because we were doing the first section of the Stewart calculus book in one day of class. If you know this book, you realize this is impossible because there is an enormous amount of stuff crammed into this one section. Two items covered in that section are how to calculate and reduce the difference quotient and doing word problems. Each of these topics alone can cover multiple class meetings, since many students are historically rusty or just plain bad at manipulating formulas correctly and suffer instantaneous brain-lock when put into the presence of a word problem. So, my thought was to go all Eric Mazur on them and farm out the material that is most likely to be easy review for them as an outside “reading” assignment, and spend the time in class on the stuff that on which they were most likely to need serious help. Our first class was last Tuesday and the second class wasn’t until Thursday, so I assigned the three videos and three related exercises from the Stewart book for Thursday, along with instructions to email questions on any of this, or post to our Moodle discussion board. I made up some clicker questions that we used to assess their grasp of the material in these videos, and guess what? Many students didn’t have any problems at all with this material, and those who did got their issues straightened out through discussions with other students as part of the clicker activity. They’ll be assessed in 2 or 3 other ways on this stuff this week to make sure they really have the material down and are not just being shy about not having it. But it looks like using screencasts to motivate student contact with the material outside of class worked fine, at least as effectively as me lecturing over it. And we had more time for the hard stuff that I wouldn’t expect students to be able to handle, not all of them anyway. Comments Off on This week (and last) in screencasting: Functions!